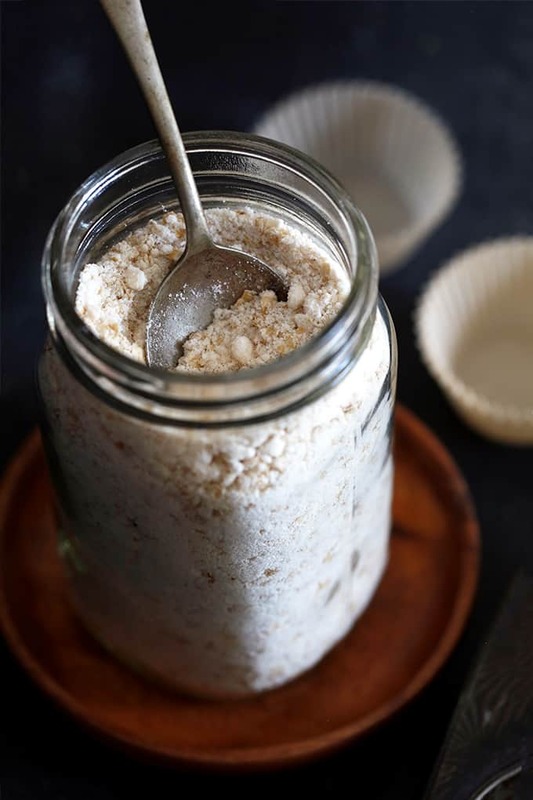 This six ingredient Homemade Oatmeal Muffin Mix is perfect to keep on hand in your pantry for a quick breakfast and also makes a great gift. Why buy store bought when homemade is better for you and your wallet? When Andy and I were dating in undergrad, after his parents visited he always seemed to have some type of baked good on hand that his mom had left behind. Lucky for me, I often got to enjoy them. One that became a fast favorite, was her Oatmeal Chocolate Chip Muffins. A great late night snack option when Andy was studying and I was building models for my interior design classes. Little did I know just how easy were they were to make thanks to this Homemade Oatmeal Muffin Mix. 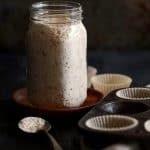 This six ingredient Homemade Oatmeal Muffin Mix is perfect to keep on hand in your pantry for a quick breakfast and also makes a great gift idea for neighbors, teachers or anyone you’d like to share a little homemade goodness with. Why buy store bought when homemade is better for you and your wallet? 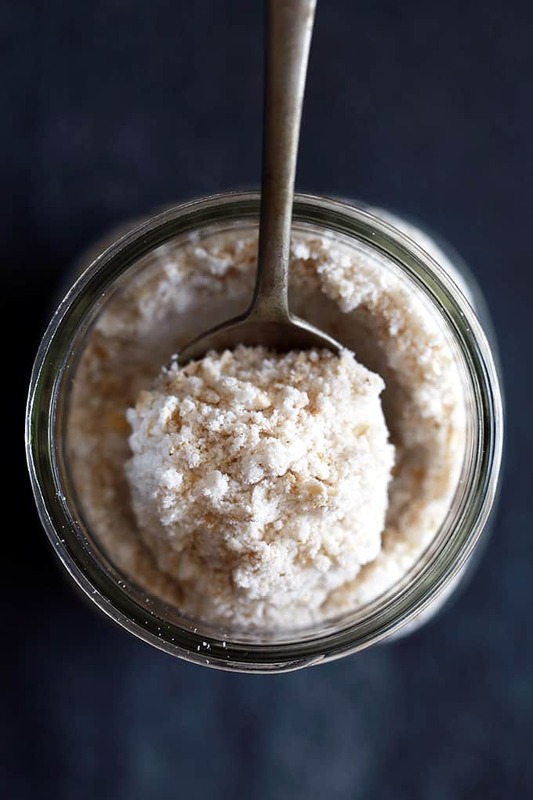 Flour, sugar, salt, baking powder, vegetable shortening and quick cooking oats – all pantry staples in my house! – are the key ingredients to this kitchen shortcut recipe. A word of warning: you’ll need a VERY large bowl to make a batch of this mix. I actually end up using the seven quart bowl from my stand mixer. 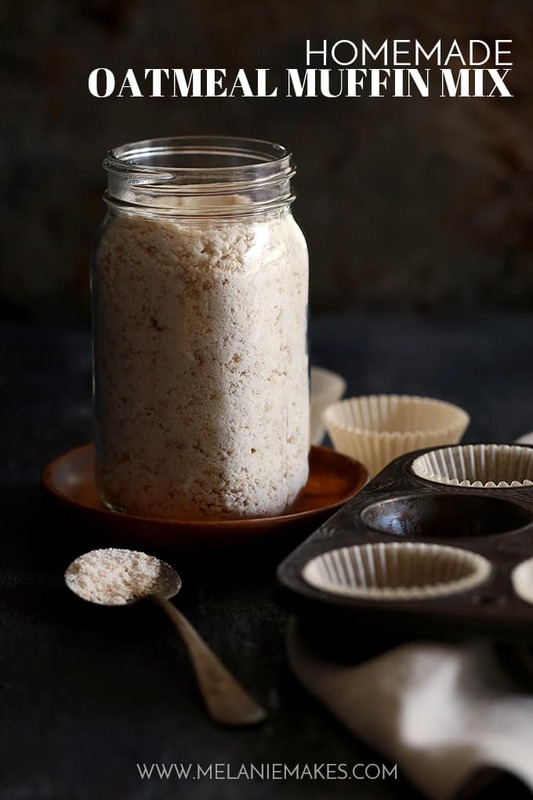 Sure, you could always cut the recipe in half, but to me being able to make a batch of this Homemade Oatmeal Muffin Mix that will equate to nearly seven dozen muffins is totally worth the effort of getting out a bowl that will contain all of the ingredients! I love storing the mix in quart canning jars as three cups of the mix fits in each jar. The exact amount called for to make a dozen muffins. In a large bowl, whisk together flour, sugar, salt and baking powder. Using a pastry blender, cut in shortening until it's the consistency of corn meal. Store for later use, each recipe will use 3 cups of mix. Mix is shelf stable and is perfect stored in zip top bags or glass jars in the pantry. Looking for other homemade mixes? You’re guaranteed to love this super easy Homemade Mexican Spice Mix, The Best Homemade Brownie Mix and luscious Homemade No-Cook Instant Pudding Mix. I am a little puzzled about your use of ounces instead of a volume WRT the oatmeal. Is this supposed to be 18 ounces by weight or by volume, which would be about 2 1/4 cups. Hi, Rosemary - Sorry for the confusion! It's an 18 ounce container of oatmeal - usually the smaller size that you find on store shelves. Hope that helps! Where are the directions for bak8ng? Hi, Midge - The directions are in each individual recipe that is linked within the post. Let me know if you don't see them! Hi, Anna! Not a dumb question at all - I'm sure you have lots of ingredients in Europe that would confuse me! Vegetable shortening is a solid until melted so the muffin mix doesn't have any liquid in it until it's actually used in a recipe. Doing a little research, there appears to be a product called Trex available in Europe that's a solid vegetable shortening that should work in this recipe.Definitely let me know if you give it a try! I like the idea a lot. I don't use shortening though and am wondering if using coconut oil to replace it would work...Also, how would oat flour and other no no-wheat flours go in this recipe? Ideas on these two issues would be much appreciated! Hi, Reem! I haven't tested this recipe with coconut oil so can't say for certain. The same with other flours. Definitely let me know your results if you give it a try! Hi! This mix sounds delicious. If I substitute gluten-free flour will it perform the same? Hi, Erica! Unfortunately, I'm not sure as I haven't tried it before but if you do, I'd love to know your results! It's so great to have on hand! I've been keeping mine in a big glass jar so I can get what I need easily. I really like the idea of a muffin mix! Can you substitute rolled oats for the quick cooking oats? Thanks, Honey! I haven't tested the recipe using regular oats, but if you do, let me know your end result! What a great idea - having all the dry ingredients already prepared and ready to go! I would never have thought to do this but it makes so much sense and makes whipping something up so much easier and quicker. And really, it's no more time to measure out several batches that one batch. Just divide evenly and throw in separate containers. Just need to make room to store it. Definitely going to try out your homemade mix recipe (was just looking at your Yogurt Blueberry Oatmeal Muffin recipe which is what brought me here) and going to make up several batches for future use. You're absolutely right, Karin - makes life so much easier! In fact, I need to make another big batch as I'm currently out and my little ones are demanding muffins! Is there any "Nutritional Value information on this mix? Like Cholesterol types, fat amts., etc? I am looking forward to making the blueberry muffins, but am concerned about using "shortening". Hi, Suzanne - you could easily plug the recipe into an online nutrition calculator to get the information you're looking for. Just be sure to note that you're using 3 cups of the mix per dozen muffins. Hope that helps! Hi, Tina - greetings from the US! I often use Crisco, an all vegetable shortening product easily found in the United States. Hopefully you can find something similar in Switzerland. Let me know if I can help with any other questions! Looks great. Just wondering, as I seem to be deficient when it comes to using a pastry blender, will it "overwork" the flour, like it can with pie pastry if you use a food processor to cut in the shortening? Has anyone tried? Hi, Tracy! You're really just using using the pastry blender to break up the shortening into pea size pieces into the rest of the mix. Because the mix makes a LOT, I don't think using the food processor to do so would be a great idea, although I haven't tried it. I usually make my mix in an 8 quart stock pot before dividing it up into smaller containers for later use. Looking forward to trying this in your apple cinnamon muffins. Maybe I missed it, but in the blog for the mix you said it was great for a quick breakfast. Do you cook it and eat it like oatmeal??? Or were you referring to the apple muffins making a quick breakfast? If this base recipe works for me, I'll be watching for more recipes to use with it. Hi, Lori! For quick breakfast, I was meaning that because the mix is already on hand it's just adding a few other ingredients and they're in the oven in no time. Let me know if you give it a try! Made this a few weeks back. Loved it! Very easy! Most of my cooking comes from boxes and cans so this is a great base recipe that truly is "homemade." Since you said it needed a "VERY large bowl" I cut the recipe in half and dug out my biggest Martha Stewart metal bowl. A half batch fit just right. (I'm planning on borrowing my mom's HUGE green tupperware bowl to make a whole batch for xmas gifts for family.) P.S. I got 8.5 cups of mix out of the half batch. I really love that the mix is shelf stable (I had to think about that...I haven't used Crisco in years. In thinking back, we always stored Crisco in the cupboard.) Review of the apple muffins to follow. Planning on making banana muffins later this week. Hoping you will continue to post more recipes to make with this great starter! (Oh, and do you have any other awesome mixes or make aheads as great as this?? With a little baby running around and having to go to work and do stuff around the house, every little bit helps! Thanks! So glad you liked it, Lori! I have more recipes in the work utilizing this mix, so stay tuned! What a great idea. I love muffins and this will be so easy! My husband usually cooks me my favorite meal.....lamb! thanks for the recipe, looks good can't wait to make some! You're so welcome, Melinda - let me know if you give them a try! These sound really good, but I'm confused. I don't know if I'm just not seeing it, or the instructions are on a different post, but how long and at what temperature would I bake these if I just wanted oatmeal muffins or oatmeal chocolate chip muffins? And is the 3 cups of milk what I would add to whole muffin mix and nothing else? Hi, Katrina - this is just the recipe for the mix. I've linked to my Cinnamon Apple Oatmeal Muffin recipe that uses the mix as it's base. That recipe contains all of the ingredient and temperature details. Hope that helps! Hi, Linda - I just use Crisco for this recipe. Any shortening will do! It's perfectly shelf stable in your pantry! Thanks for the chance to win. My hubby always takes me out to eat on my birthday! This is a recipe I'm excited about trying! You're so welcome, Terry - let me know if you give it a try! I always celebrate my birthday by making a cake for the family to enjoy and we always go out to dinner. Sounds like a great day, Lizette! My hubbie and I give each other trips (usually short weekend) for our birthdays. The oatmeal muffin mix sounds fab! Must try! Love that idea, Carol! Let me know if you give the recipe a try! Hi, Shanti - I use Crisco for this recipe. Easy peasy as my four year old would say! I have tried substituting it with other ingredients so I'm unsure of how it would turn out. If you give it a try, let me know your results! I live far from my family and childhood friends so I celebrate my birthday talking on the phone with everybody and reading their messages on mails or FB and then go to dinner with my husband and stepdaughters. Sounds like a great day, Loly! I always bake myself a cake. And my husband takes me out to dinner. Love the idea of making it as a gift! Fun! A perfect mason jar gift idea, Kristen! This sounds yummy and it's great that it stores easily! I usually celebrate my birthday by just plain doing no chores etc. I like how you roll, Dee! 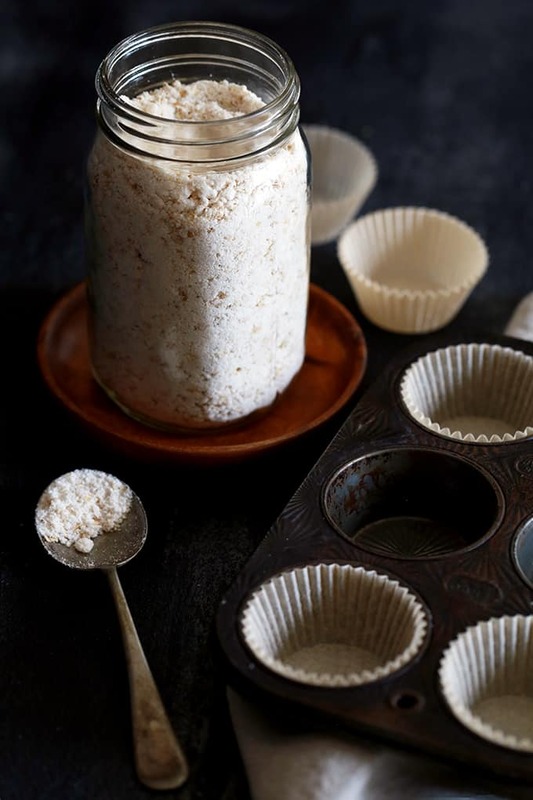 I love the idea of this homemade oatmeal muffin mix. I will be giving this one a try! Thank you!! On my birthday I make my own cake (I don't mind), and we have it after dinner, and sometimes I get a nice present or two. Sounds similar to my birthdays, Margot! What a great idea for Christmas gifts! Thanks for sharing your recipe for the oatmeal mix..
No problem, Betty - thanks for stopping by! I am over the moon happy to have this basic oatmeal muffin mix. I can't wait to try it with the Oatmeal Cinnamon Apple recipe. Thanks so much for your kind words, Anne! Be sure to let me know what you think if you give them a try! What a great idea for a recipe! Need to have this on hand to have warm muffins on cold days! Thanks for the giveaway! oatmeal muffins ARE delicious! love this simple muffin mix!! 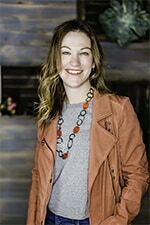 Love the recipes you have shared with Jennifer McGuire. This recipe is great for gifts at Christmas.. Thanks for sharing. Thanks so much, Sharon - just love Jennifer! And you're right, this makes a wonderful holiday gift! Surrounded by family and friends . . . And CAKE!!! I like the way you think, Lynn! This would be a great mason jar gift mix! And the possibilities for add-ins are endless. Absolutely, Laura - love giving this in a mason jar with the recipe tied around the neck! Happy to have this recipe Mel! Thanks for sharing, as usual! You bet, my friend - let me know if you give it a try! That's so sweet of your man's parents! I remember how awful our dining hall food was, so I'm positive that homemade muffins (especially ones with chocolate chips -- I'm such a chocoholic!) would've been such a welcome treat. And I love how easy this mix is to make! :) Already pinned! Sounds like the perfect day, Debbie! I celebrate with a quiet dinner with family than go out with friends! I celebrate my birthday by having a family get together for dinner. 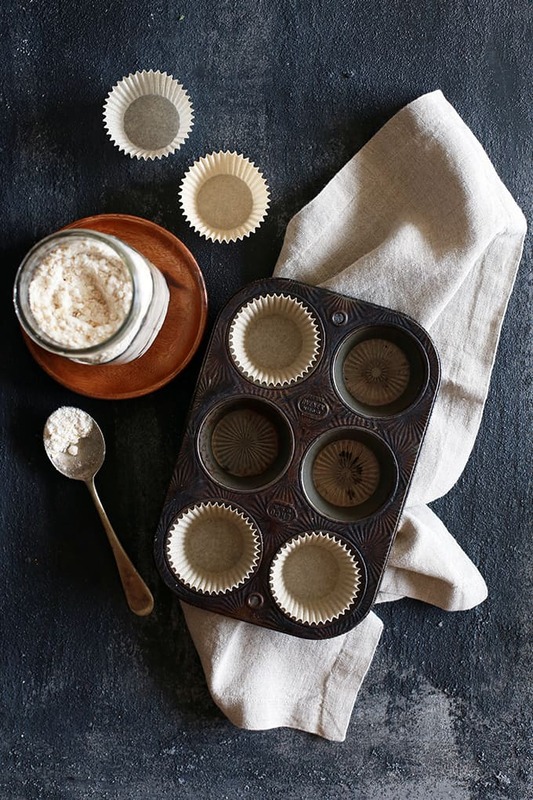 Love this homemade muffin mix idea! Can't wait to see your recipe on Tuesday. By the way, how do you store the mix? In the pantry? Hi, Shinee! Yes, this is shelf stable and perfect for storage in the pantry! I usually divide it up in either mason jars or zip top bags in 3 cup measurements so it's ready to go whenever I'm set to make muffins. Hi, Angel - You can use this mix for my Cinnamon Apple Oatmeal Muffins, Raspberry Chocolate Chunk Oatmeal Muffins, Pear Macadamia Oatmeal Muffins or several others in my archives. Let me know if you have other questions! I love celebrating my birthday with my hubby and a good friend - generally cooking together and then enjoying the meal outside on the deck.